The clumsy attempt by British Prime Minister Theresa May to keep Great Britain locked inside the European Union against the wishes of the British people has exposed what serious students of politics knew all along. The new ruling class believe that choosing how they and their nation are governed is too complex for the little people and the great unwashed and therefore it should be left to the experts, i.e. themselves. Elections and mandates from the people are now treated as an inconvenience to be navigated around, ignored or worse still, overturned. 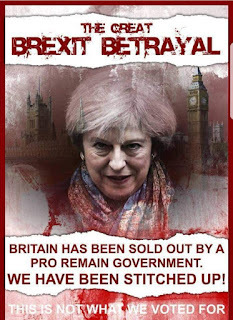 Although it is no secret that Mrs. May has always been committed to the European Union project which seeks to replace the individual nation states with a single superstate, her attempt to overturn the referendum result by subterfuge and deceit has demonstrated just how well planned the conspiracy was and what a devious, untrustworthy, treacherous rat she really is. After her appointment as Prime Minister Mrs. May made speech after speech committing herself to delivering the Brexit people had voted for knowing she had no intention of doing so. In her Florence and Lancaster House speeches she laid down the so-called red lines which were not up for negotiation. These non-negotiable red lines were that Great Britain would leave the single market, the customs union and the jurisdiction of the European Court of Justice (ECJ). This return of sovereignty to the British Parliament would allow the British people to take back control of their borders, their territorial waters and fishing grounds, their trade policy along with their laws and their money. Most importantly to the British people it would end the free movement of people and the open border mass immigration madness that has blighted and disfigured every town and city across the nation as well as being an economic and cultural disaster. 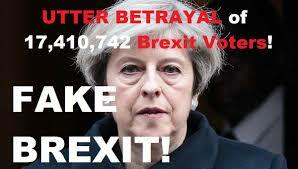 The crafted soundbite “Brexit means Brexit” became her mantra which intentionally deceived the more gullible members of the electorate into believing she was serious and intended to fulfill her promises. At the same time, she was working with the EU bureaucrats and the opposition Labour Party to overturn the referendum result and ignore the result of the 2017 general election with her Brexit-In-Name-Only plan. 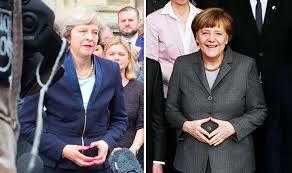 The depth of the conspiracy to deceive the British people can be confirmed by the fact that Mrs.May flew to Berlin to clear her Brexit betrayal plan with the mentally unstable German Chancellor, Angela Merkel, before revealing it to her own Cabinet which included her Brexit chief negotiator, David Davis who promptly resigned. When one looks at the facts, the scale of the treachery is revealed on all its ignominious glory. 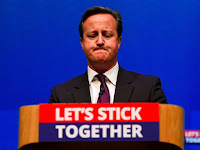 When introducing the legislation through the British Parliament the then Prime Minister, David Cameron, was unequivocal that this was a winner take all In/Out binding referendum. It was made absolutely clear that this will be the people’s decision, there would be no second referendum and the government would implement the decision. "It will be your decision, nobody else's. Not politicians, not Parliament, not lobby groups, not mine, just you. You the British people will decide". Equally important the Prime Minister and a host of government ministers and senior civil servants made it abundantly clear that voting to leave the EU would mean leaving the single market and the customs union. Cameron and his cronies used what became known as Project Fear, which cynically used lies and fake statistics, to scare the electorate into voting Remain. Despite recruiting the entire globalist machine, including President Barack Obama, to rig the outcome of the referendum the people still voted to leave and gave the government the biggest mandate in British electoral history. To compound the betrayal, in the 2017 general election both major parties vowed in their election manifestos to fully implement the result of the referendum which attracted the votes of a staggering 80% of the electorate. One would think that with two of the biggest mandates in electoral history the ruling elite wouldn’t dare ignore their orders from the people, but such is their fanatical dedication to their cause and their complete and utter contempt for the people this is exactly what they have done. The truth is that government with the consent of the governed is dead in Great Britain. 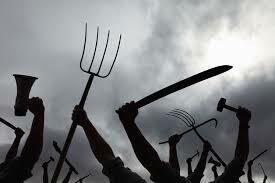 The ruling elite and the political class have overthrown the people. 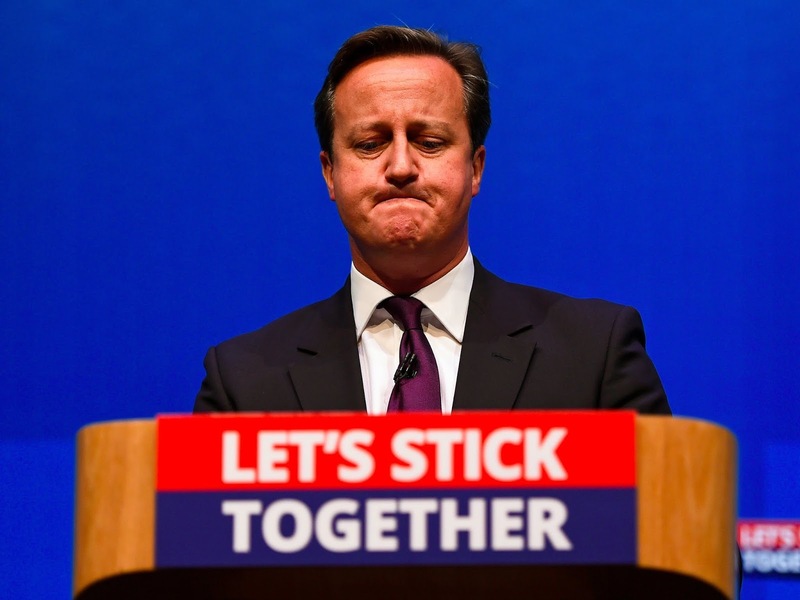 Full text of Prime Minister Cameron's referendum speech. The EU's aim is a single European State. What the world doesn’t realize as it watches the British government descend into an absolute shambles is there is much more at stake than Great Britain’s continued membership of the corrupt and failing EU. The two biggest consequences of Prime Minister Theresa May’s Brexit betrayal are the increased likelihood of a General Election and the fact that the communist controlled Labour Party has overtaken her Conservative Party in the polls. Like Theresa May’s Conservative Party, the Labour Party are also committed to remaining inside the EU with the additional nightmare of a communist disaster should the polls be accurate and the Labour Party get their hands on the levers of power. 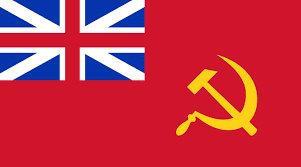 Many people believe the Labour Party leader Jeremy Corbyn and his Komrade No 1, John McDonnell, will mellow should they come to power, but these are serious communists who have spent their entire lives working to overthrow capitalism and bring down the British state they despise so much. If Theresa May is banking on the fear of a communist led Labour government to win the next election she is making a big mistake. She is underestimating the disenchantment with her Brexit betrayal and the alienation of her core support by adopting globalist dictated ‘progressive’ policies. These include the universally despised foreign aid budget, the obsession with sexuality and gender politics, imposed multi-culturalism, imposed Islamisation, imposed political correctness, destruction of the once respected police force and a selective criminal justice system which favours minorities, etc. etc. Her Merkelesque crushing of free speech in order to stifle dissent would be welcome in the communist dictatorship she is gradually easing into power as is her refusal to listen to the people including her natural conservative supporters. Whether Theresa May resigns, gets kicked out or clings onto power the British people can’t win without a drastic change in policy and judging by her initial response to the resignations in her Cabinet this won’t be forthcoming. 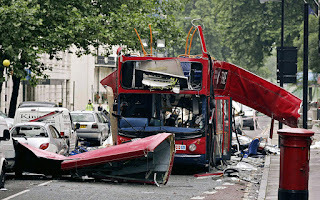 Please read a previous articles on the communist danger to the British people. It was as predictable as night follows day that the political elite would not honor the result of the Brexit referendum if the British people voted to leave the European Union back in June 2016. The global elite and their puppet political class in Great Britain have not spent four decades replacing the independent states of Europe with a single European superstate only to have it scuppered by the great unwashed just when the project was on the verge of completion. Since her appointment as Prime Minister, Theresa May has re-iterated on multiple occasions that she will implement the decision of the British people to leave the European Union and all its institutions including the single market, the customs union and the jurisdiction of the European Court of Justice. Any student of Mrs. May’s political career will have noted that she is an unashamed and accomplished liar who in line with the rest of the political class believe that spin, deceit and lies are legitimate tools to be used in the pursuit and wielding of power. One important observation from the Brexit issue is the fanatical dedication of the political elite to the creation of the United States of Europe. These dedicated Europhiles will risk everything and stop at nothing for their beloved EU project, that includes crashing the British economy even if it causes further damage to the Eurozone economies and re-igniting the civil war on Island of Ireland. Such fanatical dedication to create a superstate is justly comparable with the efforts of the Muslim Ummah to create an Islamic State in Iraq and the Levant (ISIL) in the middle east. To its fanatical Europhile supporters, the European Union is their Caliphate. Theresa May is a life-long Europhile therefore it was unlikely she would take any action that would jeopardize her beloved EU project. 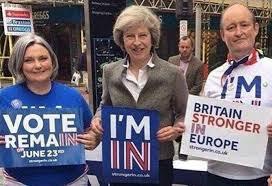 Her mission from the moment she was appointed Prime Minister was to keep Britain inside or subject to the EU and its institutions while giving the appearance of leaving. This is the aptly named ‘Brexit-In-Name-Only’ stitch-up (BRINO) we have heard mentioned in the media. The repercussions should the referendum mandate not be implemented in full will be enormous and far reaching and possibly violent. The much-vaunted Mother of Parliaments in Westminster has proved itself to be nothing more than a wretched hive of scum and villainy who hold democracy and the British people in contempt while stuffing their own pockets and those of their families and cronies with the fruits of taxpayer labour. If in the unlikely event these charlatans see the error of their ways and reject this sell-out or the EU bureaucrats themselves reject it, then hopefully it will be the catalyst that starts a revolution that will drain the fetid swamp that British politics has become and herald in a new age of self-governance that will once more be the envy of the world. 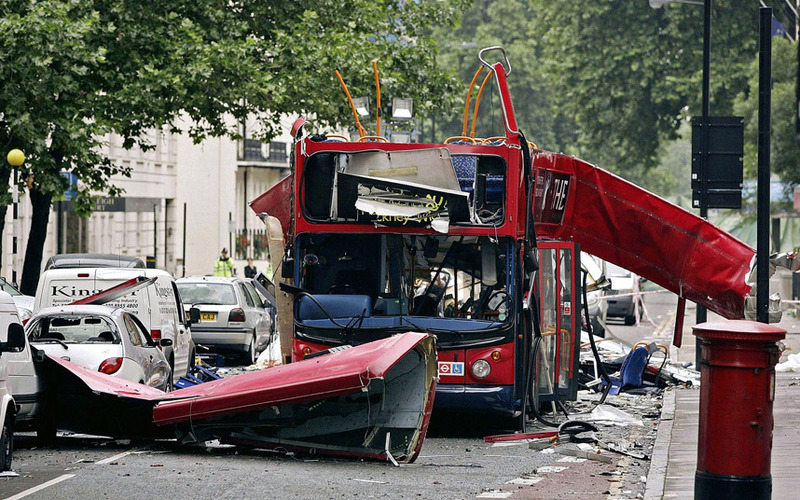 In memory of those killed and injured by Muslim terrorists in London on July 7th 2005. The ruling political elite would rather we forget but we never will. Nor will we forget, or forgive, their treachery in allowing the perpetrators the freedom to plan and execute their murderous deed.